There was a time when U.S. central bankers worried that inflation was too high, and they tried to bring it down. Now the opposite is true: the Federal Reserve is concerned that inflation has remained stubbornly low, and it’s trying to boost prices. The reason: persistently low inflation raises the risk that prices will actually start to decline, a dangerous condition known as deflation. That’s bad news because it makes people less willing to borrow and spend—anticipating lower prices, consumers will put off spending—and could also lead to a fall in wages. To avoid such a damaging spiral of falling prices and wages, the Fed targets a 2 percent inflation rate. That’s one half of its so-called dual mandate of price stability and full employment. And while the Fed has managed to bring the unemployment rate down to 4.9 percent, inflation has remained below its goal. Low unemployment without an acceleration in inflation has also raised the question of whether the tradeoff between inflation and unemployment (known as the Phillips curve) has weakened or even disappeared post-Great Recession. In econspeak, has the Phillips curve become flatter? Our new study looks at the individual components of inflation to better understand its relationship to unemployment. We find that a fairly flat Phillips curve plus global forces have conspired to keep core inflation down. These findings have implications for the future path of interest rates. Recent IMF research finds no evidence for a change in the slope of the Phillips curve post-Great Recession. In other words, the authors find that the inverse relationship between inflation and unemployment has not changed. Rather, what appears to have changed after the global financial crisis has been the nature of economic shocks that have hit the U.S. economy. These shocks, such as weaker global growth, have been disinflationary and kept inflation low even in the face of a labor market that is approaching full employment. The result is a weakening in the correlation between unemployment and inflation. Our parallel work reaches a similar conclusion but from a different perspective. We focus on so-called core inflation, which strips out volatile food and energy prices, and has been persistently below 2 percent (see Chart 1). Because of such volatility, core inflation is a better predictor of longer-term price trends. By looking at the individual components that feed into core inflation, we find that the slope of the Phillips curve—that is, the responsiveness of inflation to changes in unemployment, all else held constant—has been the same over the past 20 years or so and has not changed after the global financial crisis. The slope, though, is very flat. In particular, a one percentage point decline in unemployment only nudges core inflation up by a cumulative 0.1 percentage points over the following two years. Taking a deeper bottom-up look at inflation dynamics reveals that foreign rather than domestic factors are keeping core inflation low. 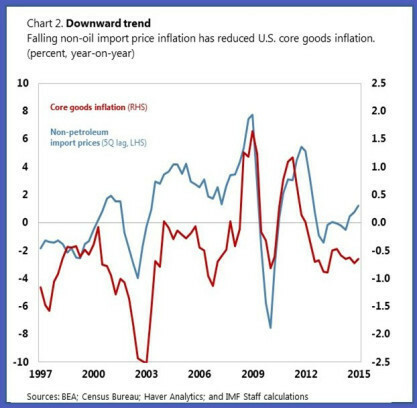 Specifically, falling core prices of goods being exported to the United States from China, Canada, the euro area and Mexico, as well as the strengthening of the U.S. dollar have both significantly reduced non-oil import price inflation, which, in turn, have resulted in falling domestic core goods prices (see Chart 2). 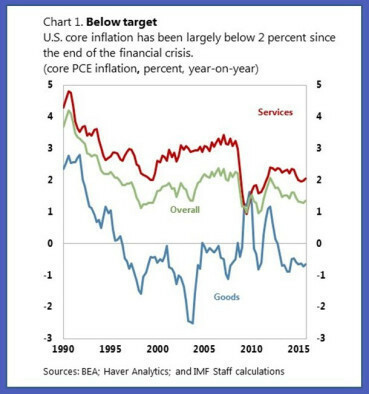 Low imported inflation has also played a role in holding back core services inflation (but to a lesser extent than core goods inflation). However, declining unemployment and expectations that inflation will ultimately return to its target—bolstered by Fed credibility—have been offsetting factors, particularly for housing services. 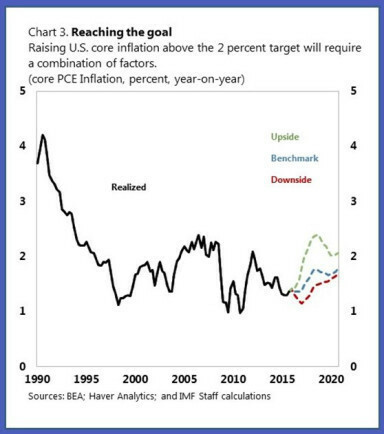 Using a disaggregated approach to forecast inflation reveals that the United States is likely to face challenges getting inflation back to the Fed’s medium-term goal of 2 percent. Indeed, it would take the combination of a depreciation of the U.S. dollar, a continued decline in the unemployment rate (which is already quite low), a pick-up in house price inflation, and rising wages in the health sector (which has a large weight in core inflation) to generate inflation much above 2 percent (see the upside scenario in the Chart 3). The monetary policy implications of the benchmark scenario—which entails more conservative assumptions, including a constant dollar and house price inflation—are clear. The Fed’s low interest rate policy has been appropriate and future interest rate increases will need to proceed cautiously and gradually to ensure that inflation gets back to 2 percent target over the next few years.